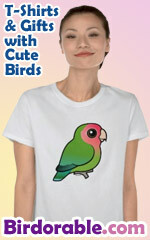 Home > Birding Apparel & Gifts > Funny Birding T-Shirts & Gifts > Scope In Your Pocket...? A cute cartoon LBJ (little brown job) asks "Is that a scope in your pocket or are you just happy to see me?" Some birds get birders more excited than others. If the celebrity bird knew he was the source of such birdy excitement, he might ask this very question.